Lemonade has never really been my first choice. I blame that on the fact that I've had too many glasses filled with syrupy, fake-tasting imposters posing as lemonade. I remember going to restaurants and ordering lemonade on a few occasions with the expectation that it would be something ethereal and lovely. Instead, I've been disappointed time and time again. Despite my bad experiences, I've been completely obsessed with making my own lemonade lately. I'm not sure what makes it so appealing because, unlike most foods, truly good lemonade doesn't remind me of any specific time or place. Maybe it's something more along the lines of fulfilling the idea of a perfect summer day as opposed to an exact memory of one. I think we can all picture a day full of playing and working under the hot sun, interrupted by a few peaceful moments in the shade, holding a glass of lemonade and feeling the refreshing, cold condensation. As I have been experimenting with different ratios (simple syrup, water, and lemon juice), I have also been working with different cocktail and mocktail editions. It's really wonderful creating different combinations with homemade lemonade rather than store-bought because it's so simple to control the sugar. For example, one of the versions I have to share with you involves the addition of cherry juice, which is quite sweet naturally. If I were to add it to any type of lemonade from a dry mix or in a plastic bottle, I think it would be much too much sweetness. A lesson in cooking and mixology: it's easier to add more vs. take away. Making your own lemonade is not as difficult as it may sound. Purists may disagree, but I think it is perfectly acceptable to buy a bottle of lemon juice (organic, please) rather than juicing your own. Make a little simple syrup, mix it with the lemon juice and some extra water and you're all set! 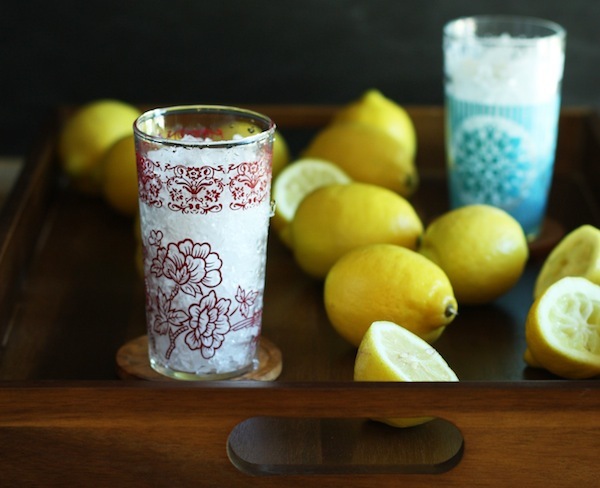 Cherry-lemonade is a lovely, family-friendly twist on traditional lemonade. I use unsweetened cherry juice, which you can find in the juice aisle of most grocery stores. For more adult occasions, a little splash of vodka is nice. And for gin fans, add some Blue Sapphire and a splash of soda water. If you want to get really fancy, you can add some basil, rosemary, or lavender to your simple syrup for a pleasant, calming combination. 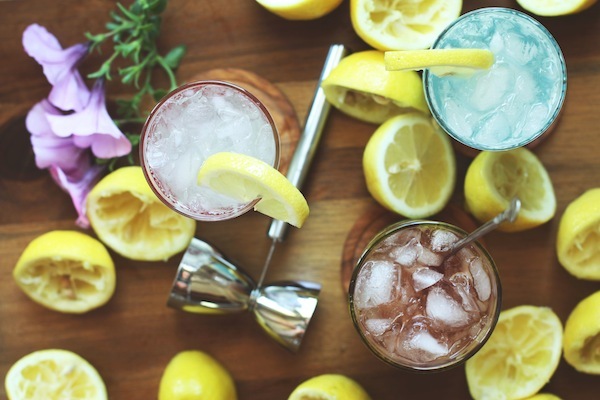 Three easy, tasty ways to enjoy lemonade. Now you have no reason to not make your own. So hop to it! Announcing Set the Table Playlists! To top off your Friday, here's a new feature done by my lovely sister and playlist wizard, Rebecca. She will occasionally be sharing playlists with you that are perfect for listening to while sipping away at your cocktail! Click here for playlist #1! Begin by making simple syrup: Combine the sugar and 1 cup water in a saucepan over medium heat. Stir constantly until sugar dissolves and a few bubbles start to rise. Remove from the heat and let cool. In a pitcher (fill with ice if the lemonade will be used immediately), combine the lemon juice, simple syrup and 4 cups water. For a vodka lemonade, add 2 oz. vodka to a glass filled with ice. Top with lemonade and serve. Follow the recipe above for homemade lemonade and add 1/2 cup cherry juice to the pitcher. Stir to combine and serve! This also works well with vodka. Follow the recipe above for homemade lemonade. In a glass filled with ice, add 2 oz. gin. Fill almost to the top with lemonade and finish with a splash of soda water.